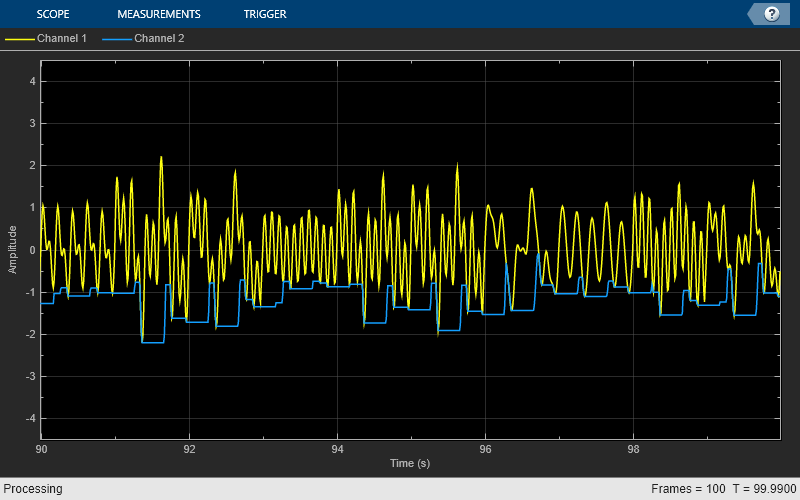 The dsp.MovingMinimum System object™ determines the moving minimum of the input signal along each channel, independently over time. The object uses the sliding window method to determine the moving minimum. In this method, a window of specified length is moved over each channel, sample by sample, and the object determines the minimum of the data in the window. For more details, see Algorithms. Create the dsp.MovingMinimum object and set its properties. movMin = dsp.MovingMinimum returns a moving minimum object, movMin, using the default properties. movMin = dsp.MovingMinimum(Len) sets the WindowLength property to Len. movMin = dsp.MovingMinimum(Name,Value) specifies additional properties using Name,Value pairs. Unspecified properties have default values. Flag to specify a window length, specified as a scalar boolean. true — The length of the sliding window is equal to the value you specify in the WindowLength property. false — The length of the sliding window is infinite. In this mode, the object determines the minimum of the current sample and all the past samples. Length of the sliding window, specified as a positive scalar integer. This property applies when you set SpecifyWindowLength to true. y = movMin(x) determines the moving minimum of the input signal, x, using the sliding window method. Data input, specified as a vector or a matrix. If x is a matrix, each column is treated as an independent channel. The moving minimum is determined along each channel. The object also accepts variable-size inputs. Once the object is locked, you can change the size of each input channel, but you cannot change the number of channels. Moving minimum output, returned as a vector or a matrix. Compute the moving minimum of a sum of three sine waves with varying amplitude. Use a sliding window of length 30. Set up an input signal that is a sum of three sine waves with frequencies at 2 Hz, 5 Hz, and 10 Hz. The sampling frequency is 100 Hz. Create a dsp.MovingMinimum object with a window length of 30. Create a time scope for viewing the output. Each sine wave component of the input signal has a different amplitude that varies with the iteration. Use the movMin object to determine the minimum value of the current sample and the past 29 samples of the input signal. In the sliding window method, the output for each input sample is the minimum of the current sample and the Len - 1 previous samples. Len is the length of the window. When the algorithm computes the first Len - 1 outputs, the length of the window is the length of the data that is available. When you do not specify the window length, the algorithm chooses an infinite window length. In this mode, the output is the minimum of the current sample and all the previous samples in the channel. 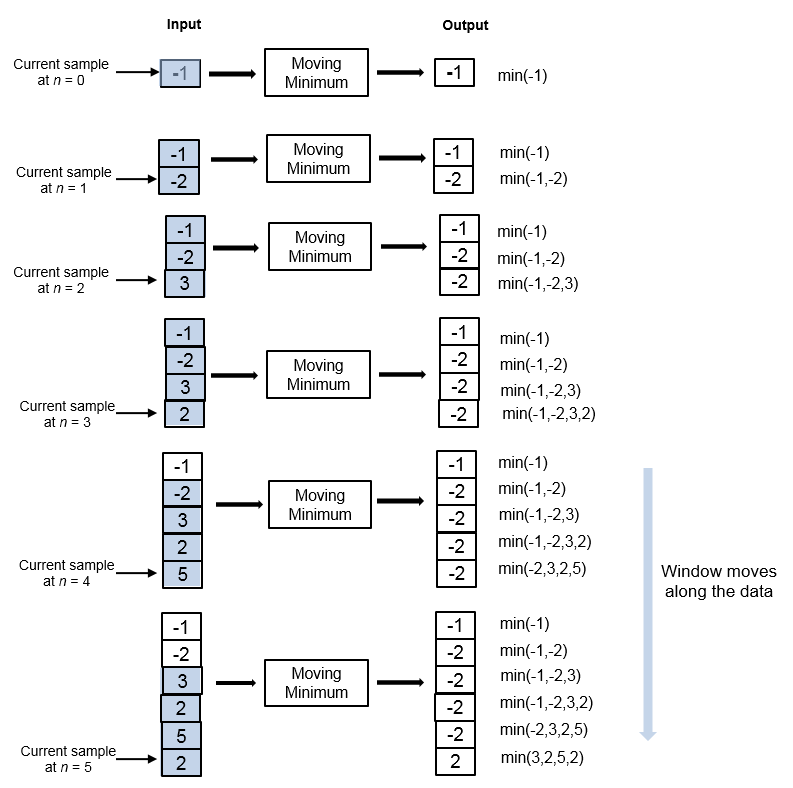 Consider an example of computing the moving minimum of a streaming input data using the sliding window method. The algorithm uses a window length of 4. With each input sample that comes in, the window of length 4 moves along the data.